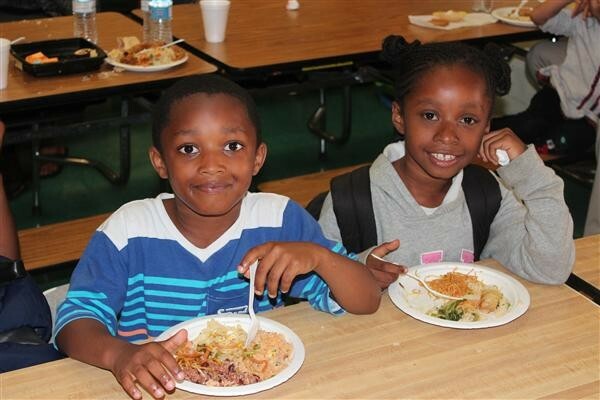 Without the after-school meals, students’ ability to learn may be harmed. Students who are used to eating a hot meal after school through the Oakland Unified School District’s supper program will have to go hungry this year due to budget cuts imposed by the school board. School staff say elimination of the program will negatively impact dozens of schools and thousands of students. At Manzanita Community School, about 70 students used to receive fresh fruit, milk, and a hot meal five evenings a week. Out of necessity, some families even brought younger siblings in to eat, Phung said. After-school coordinators are now encouraging parents to send their children to school with snacks to replace the supper they used to receive. But this is not a sustainable solution, Phung said. In a school district where over 75 percent of students qualify for free or reduced-price lunches and after-school programs run until 6 p.m., placing the onus of providing a more substantial meal on parents only hurts students. Nutritious meals, fresh fruit, and milk are replaced with chips and juice boxes, Phung said. Many families simply can’t afford the extra food. And without the meals, students’ ability to learn is harmed. “Nutrition and hunger directly impact brain development,” said Anna Johnson, a psychologist at Georgetown University, in an interview. “The availability of key nutrients affects social and intellectual growth.” Hunger also affects behavior, Johnson said. Hungry students end up distracted, frustrated, and unable to learn. “Being hungry leads to shorter fuses and attention spans,” she added. While the loss of sports programs due to OUSD budget cuts in June has attracted ample attention, the cuts to the supper program may be just as impactful — especially for the school district’s most vulnerable students. The cuts to sports programs in Oakland received national press coverage and led to over $300,000 in donations in order to continue offering various athletics programs. The Raiders donated $250,000, and the A’s, Warriors, and 49ers plan to contribute as well. The supper program’s benefits go beyond simply providing a hot meal, said Christina Gomez, mother of Oakland Technical High School students. Gomez’s assertion is supported by a growing body of evidence linking food insecurity in low-income households to decreased test scores and increased likelihood of disciplinary infractions. The shuttering of the supper program can also affect students indirectly, Johnson said. In situations of food insecurity, the stress of not knowing how food costs will be met can be as injurious as the hunger itself. 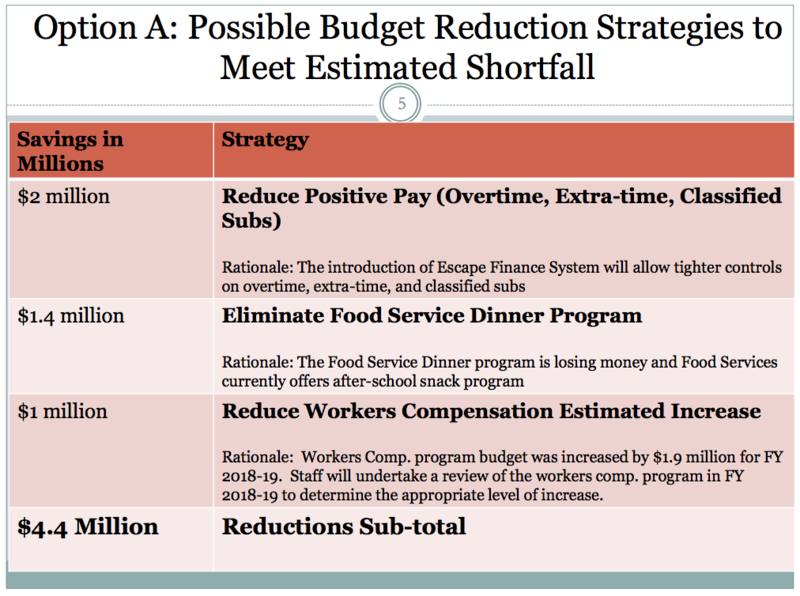 A slide from a June budget presentation indicated as much as $1.4 million could be cut from the district's supper program. OUSD’s $5.8 million budget cut passed in June comes on the heels of last year’s $9 million cut. According to a budget presentation from last year, approximately $1.4 million was eliminated from the district’s after-school dinner program. Cassaundra Reed and Gwendolyn Taylor, supervisors of the supper program, say when food costs, salaries, and benefits are accounted for, the cuts may save the district just north of $1 million. All of the 32 school sites where the program was offered were asked to reduce spending, Reed and Taylor said. The district’s nutrition office hopes to find funding in the budget somehow in order to reconstitute the supper program. OUSD’s Chief Business Officer Marcus Battle is open to creative solutions that could save some if not all of the supper program’s sites, said Taylor and Reed. Coordinators understand why the school board went after the supper program. Even though Edna Brewer’s supper program used to serve nearly 200 students each weekday, Lee says few families have asked about its absence. “We’re hearing more about the cuts to other programs,” Lee said. Correction: The district reduced the supper program's budget in June of this year, not last year as this article originally stated. And the June 2018 budget cut across the entire district was $5.8 million, not $8 million.